Sunday’s anti-US base rally in Okinawa has piled further pressure on Prime Minister Yukio Hatoyama and his government as they seek to find an alternative location site for the Futenma air base by the end of May. With a claimed attendance of 90,000 people, including representatives of all the political parties and all but two of the prefecture’s local leaders, this was reportedly the biggest rally of its kind in the prefecture, and the first to be organized across party lines. Okinawa Gov. 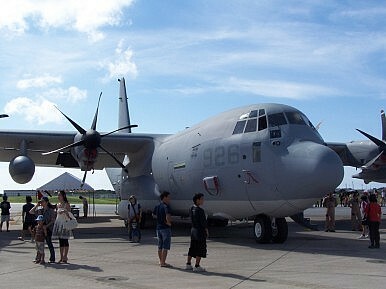 Hirokazu Nakaima decided to take part at the last minute, so much attention focused on whether or not he would insist that the relocation of the US Marine Corps Futenma Air Station took place outside Okinawa prefecture and not at Henoko in the prefecture as stipulated in a 2006 US-Japan agreement. A Washington Post report at the weekend said that Foreign Minister Katsuya Okada had told US Ambassador to Japan John Roos on Friday that the Japanese government would accept large parts of the 2006 deal to relocate the base within prefecture with modifications and with some base functions moved elsewhere. While the Post described this as ‘the first significant good news’ since September regarding the problem, both Hatoyama and Okada denied the report. As expected, the rally passed a resolution calling for a relocation of the base outside the prefecture, but in the end Nakaima himself didn’t go so far, leaving the possibility that he might not try to block a revised Henoko/Tokunoshima plan, should Hatoyama press on with this as he tries to meet his end of May deadline. But Nakaima did stress that Okinawa’s overconcentration of US bases was one that each Japanese outside the prefecture could no longer afford to ignore—a message that was strongly echoed by one of the dailies, the Asahi Shimbun, in its editorial Monday. What the Okinawa Poll MeansShattered HopesDeadline? What Deadline?Too Little, Too LateHelp Me Mr President!